Please join Adoption Knowledge Affiliates (AKA), Support Texas Adoptee Rights (STAR) and friends to raise funds for adoption education and to kick-off our annual conference. Our goal is to bring together friends, some old and some new, to have a great time while giving back. Included in each donation package are tickets to a prize drawing as well as one or more beers chosen by the brew masters at our amazing venue, Austin Beer Garden Brewing Co.
Can’t attend but still want to donate? Simply enter the amount you wish to donate. Please email aka@adoptionknowledge.org with any questions, to donate a door prize or sponsor the event. 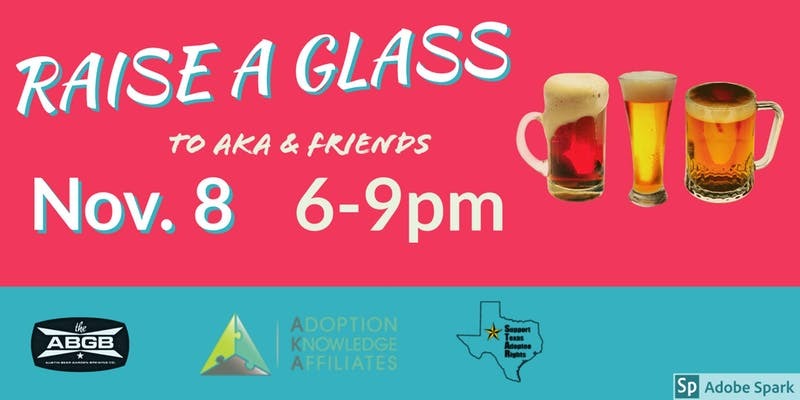 *Please note that tickets purchased at the event will benefit Adoption Knowledge Affiliates and Support Texas Adoptee Rights.